The Scentsy Buddy sale has begun! Scentsy Buddies are fun, scented, super soft and limited edition. For 11 days, select Scentsy Buddies are 40 percent off! Starting at 11 a.m. MT June 20 through 11:59 p.m. MT June 30, get your hands on Audrey the Arachnid, Eggmund the Chick, Gage the Robot, Gilly the Buddy, Parí the Poodle, Percy the Penguin, Terra the Triceratops and Vlad the Bat for just $18 (USD)/$21.60 (CAD) each! This Scentsy Buddy Blowout Sale has ended! Click here for our current availability of our Scentsy Buddies. Choose from eight Scentsy Buddies and 36 Scent Paks for just $18 (USD)/$21.60 (CAD)! The sale price is available on Buddies ordered through my Online Scentsy Store. Half-price Host Rewards and Host credit may not be used. As always, our limited-edition Scentsy Buddies are available only while supplies last, and with this great deal, they may sell out well before June 30. Hurry and order your Scentsy Buddy at these crazy sale prices, save for fun gifts. Say “aloha” with our Kahiko Hula Scentsy Bar. The exotic fragrance blends of passion fruit, sweet mango and juicy papaya will have you doing the hula and taking surf lessons. Kahiko Hula Scentsy Bar refill is available online. An exotic blend of passion fruit, mango and papaya – the perfect fragrance on a warm summer day to bring you back to that perfect island vacation. Add 4-5 cubes of Kahiko Hula candle wax cubes to your favorite Scentsy wickless candle warmer and enjoy the scent of tropical paradise. Scentsy Bars have a very low melting point and are best experienced when used in an electric Scentsy Warmer. With over 80 long lasting fragrances, including our Kahiko Hula Scentsy Bar refill, there’s sure to be a favorite for everyone. Each Scentsy bar is scored to easily break into 8 cubes, and contains 3.2 fl. oz. The fun fragrance of our Jumpin Jelly Bean Scentsy Bar includes a blend of crisp pear, juicy apple, zesty tart lemon and delicious sugar. This is the perfect fragrance to help evoke sweet childhood memories. Jumpin’ Jelly Bean Scentsy Bar refill is available online. This fragrance is fun, fruity, and will bring out your inner child with notes of pear, apple, lemon and sugar. Add 4-5 cubes of Jumpin’ Jelly Bean candle wax cubes to your favorite Scentsy wickless candle warmer and you may just want to go swing on the monkey bars, play some hop scotch, or spend some time on the swing. Scentsy Bars have a very low melting point and are best experienced when used in an electric Scentsy Warmer. With over 80 long lasting fragrances, including our Jumpin’ Jelly Bean Scentsy Bar refill, there’s sure to be a favorite for everyone. Each Scentsy bar is scored to easily break into 8 cubes, and contains 3.2 fl. oz. Look no further for a tropical vacation then our Havana Cabana Scentsy Bar. The luscious medley of pineapples, oranges, bananas and berries will have you in a sensory tropical paradise, sipping on fruity drinks with your toes in the sand. Havana Cabana Scentsy Bar refill is available online. A sensory paradise of luscious pineapples, oranges, bananas and berries, this fragrance will add sunshine and fun to your day. Add 4-5 cubes of Havana Cabana candle wax cubes to your favorite Scentsy wickless candle warmer and let the tropical island fill your space. Scentsy Bars have a very low melting point and are best experienced when used in an electric Scentsy Warmer. With over 80 long lasting fragrances, including our Havana Cabana Scentsy Bar refill, there’s sure to be a favorite for everyone. Each Scentsy bar is scored to easily break into 8 cubes, and contains 3.2 fl. oz. 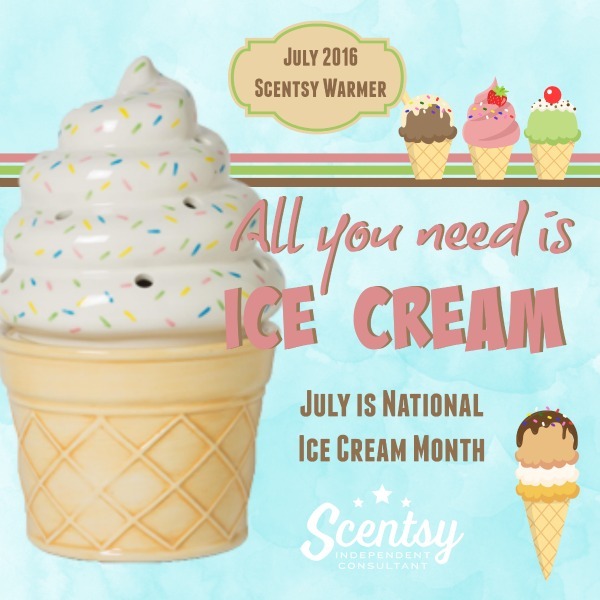 National Ice Cream Month is in July, with National Ice Cream Day the third Sunday in July, so why not celebrate with the Ice Cream Cone Scentsy Warmer. In 1904 the ice cream cone made its first debut at the World’s Fair in St. Louis, and we’ve been enjoying this refreshing treat ever since. My personal favorite is strawberry and rocky road, but like fragrance, everyone has his or her favorites flavors of ice cream. Now you can make your own ice cream cone debut with this cute hand-painted ceramic smooth finish electric candle warmer. 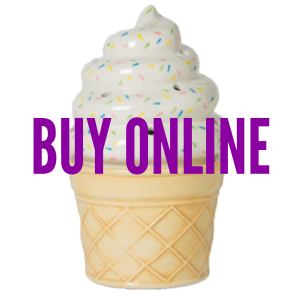 Whether it’s a fun, retro accent or a sweet reminder of sunny days, this cute little ice cream cone will be the sprinkles on top of any space, and family and friends will love it! 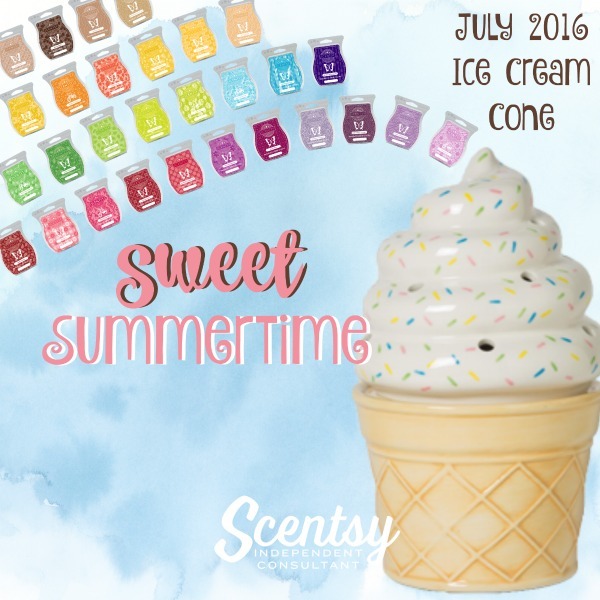 Sweeten summer with this hand-painted warmer shaped like an ice cream cone. From the details of the delicious cone crunch, to the vanilla with candy sprinkled top, it’s the perfect addition to your summer fun and decorating. Add 4-5 sections of your favorite Scentsy Bar and enjoy all the fragrance with none of the calories. 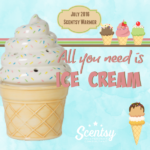 This Ice Cream Cone Scentsy Warmer includes an electric base, a warming dish, and the matching finishing swirled ice cream shaped lid complete with candy sprinkles on top. This electric candle is part of the Element Collection and uses a warming plate to gently melt the discretely hidden Scentsy wax. 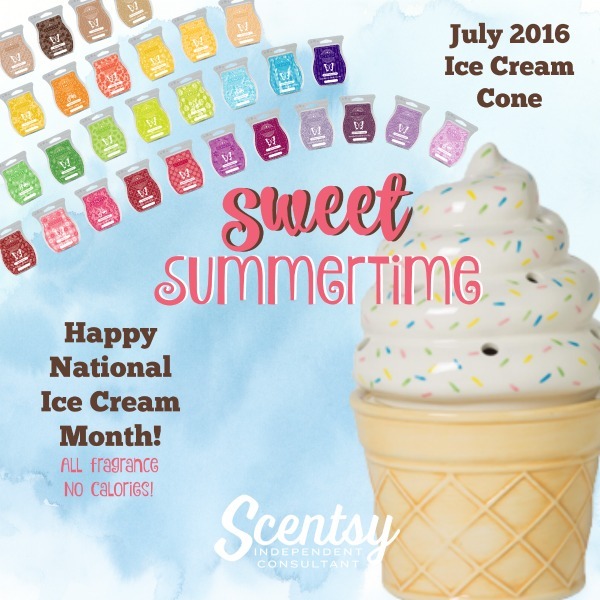 No Scentsy light bulb is needed with Ice Cream Cone. This is a limited edition item and can only be purchased while supplies last. 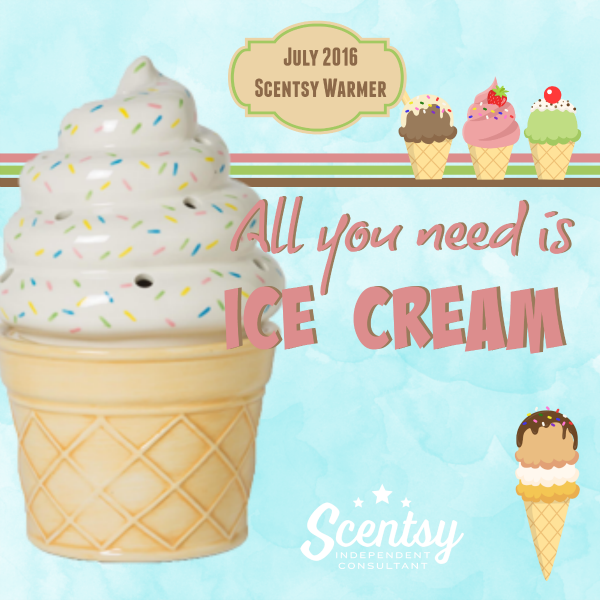 With so many Scentsy Bars to choose from, it can be hard to decide what fragrance will go best with our sweet Ice Cream Cone Warmer. To help our online customers, here’s a list of fragrances that remind me of possible ice cream flavors. Apple S’mores Scentsy Bar – Harvest apples, cinnamon glaze and a drop of coconut milk lend a tantalizing twist to classic toasted marshmallow, vanilla creame and warm cedarwood. Berry Bubble Blue Scentsy Bar – A delicious blast of blue raspberry, tart green apple and spun sugar will brighten up bath time, bedtime, anytime! Black Raspberry Vanilla Scentsy Bar – Delicious, sun-sweetened dark berries warmed with vanilla. Blackberry Meringue Scentsy Bar – Sweet blackberry, sugared fig, black plum and a pinch of ground spice, this fragrance is a to-die-for sensory dessert. Blue Raspberry Ice – Remember racing for that neighborhood ice cream truck for those red, white, and blue ice pops? This fragrance recreates those perfect childhood moments with a stack of sweet cherry, icy white lemon and blue raspberry. Blueberry Cheesecake Scentsy Bar -Thick, rich NY Cheesecake with a light graham cracker crust and delicious blueberries. 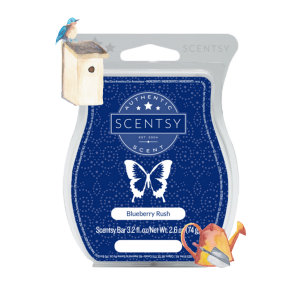 Blueberry Rush Scentsy Bar – Our Blueberry Rush Scentsy Bar blends a sweet surge of ripe blueberry with leads of luscious lively cranberry bouquet, black currant and pomegranate. It’s the smell of fruits just picked from the farm. Braeburn Scentsy Bar – Braeburn Scentsy Bar refill offers a fragrance combination of fresh picked apples, tropical fruits, whipped sugar, and vanilla to give you a fruity delight. 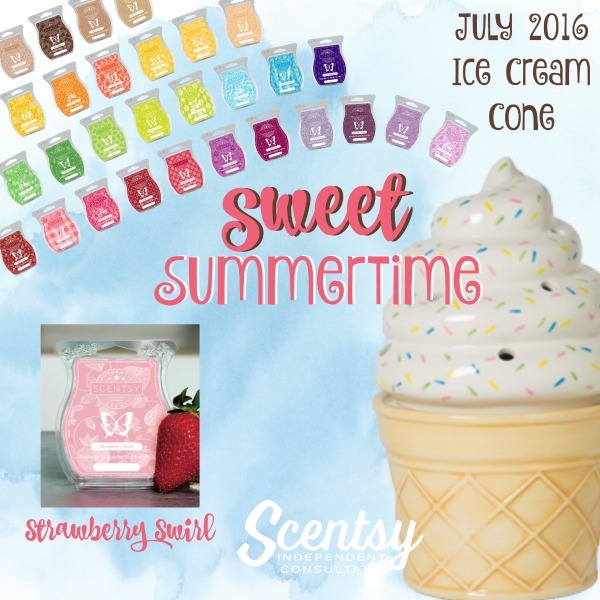 Cotton Candy Cookie Scentsy Bar – It’s a trip to the county fair. Little hands clutching cotton candy and cookies while gooey treats topped with sugared raspberries beg to be tasted. Havana Cabana Scentsy Bar – Luscious medley of pineapples, oranges, bananas, and berries. Jumpin’ Jelly Bean Scentsy Bar – Crisp pear and apple, zesty lemon, and sugar evoke sweet childhood memories. Jungle Jam Scentsy Bar – Set off on a jungle adventure surrounded by candied pear, ripe pineapple, fresh-picked strawberry and even a delightful dollop of whipped cream just for fun. Lemon Verbena Scentsy Bar – Fresh lemon zest, bright kaffir lime, and verbena leaf. Oodles of Orange Scentsy Bar – Kids will love this sweet, citrusy scent punched up by fresh pineapple, crisp papaya, mango blossom and ripe bunches of tropical berries. YUM! Paradise Punch Scentsy Bar – A medley of wild Indian orange and sunny lemon juice, açaí berries, and starfruit. 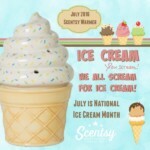 Pineapple Sorbet Scentsy Bar – Sweet and tart, like a refreshing scoop of pineapple sorbet. Raspberry Bush Scentsy Bar – Includes notes of luscious raspberry jam and black plum that are quietly cooled by a sprig of wild mint. This is a fragrance that beckons the romantic dreamer in us all. Rockin’ Ruby Razz Scentsy Bar – Birthday parties and punchbowls and presents piled high. This fruity blend of juicy orange, fresh strawberry and sweet candy glaze is a child’s best day all wrapped up in one perfect fragrance. 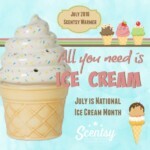 Simply Vanilla Scentsy Bar – The pure fragrance of classically warm vanilla. French vanilla with a touch of coconut milk. 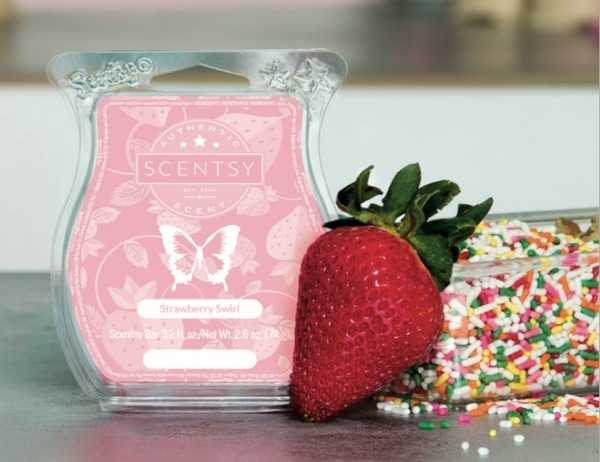 Strawberry Swirl Scentsy Bar – Like the strawberry fragrance at the local ice cream shop, Strawberry Swirl Scentsy Bar is blissfully sweet and creamy, with blends of frozen strawberry, frothy milk and vanilla. Sugar Cookie Scentsy Bar – Warm, sweet blend of butter, sugar, and creamy vanilla. Sugared Cherry Scentsy Bar – Savor the changing seasons as frosted cherry and Concord grape are sweetened by a pop of pomegranate, vanilla sugar and candied apple. Vanilla Bean Buttercream Scentsy Bar – Decadent buttercream frosting made with the freshest butter whipped with cane sugar and vanilla extract. So creamy and sweet you will have to lick the spoon! Watermelon Mint Scentsy Bar – A chilled slice of sweet watermelon, sprinkled with bracing fresh mint, makes a refreshing summer treat. Wild What-A-Melon Scentsy Bar – Your little wild one will love this fun and fruity fragrance, bursting with ripe watermelon, green apple and scrumptious sugared pineapple. 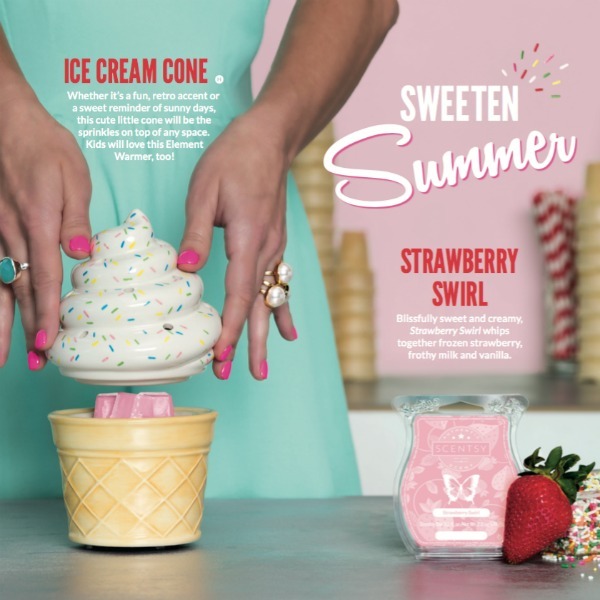 If you have a special love for the ice cream, share on social media with these fun images. If you’re a Scentsy Consultant, you’re welcome to use them as well – just personalize to make them your own. 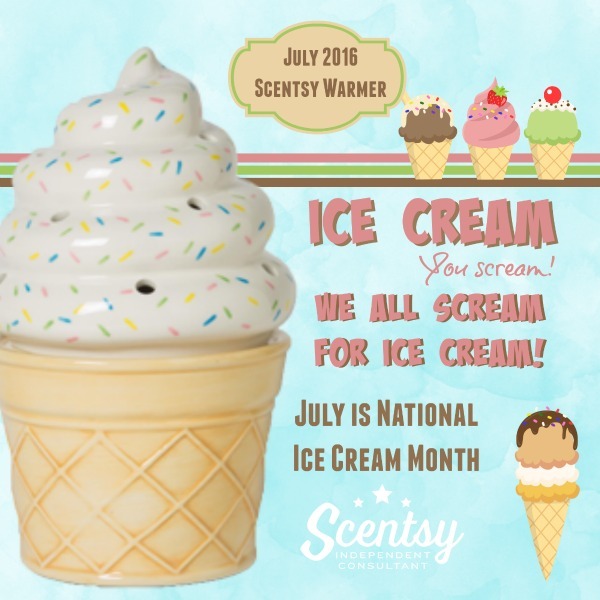 Celebrate National Ice Cream Month and National Ice Cream Day in July, and celebrate the National Ice Cream Cone Day September 22nd, 2016 with this fun Ice Cream Cone Scentsy Warmer. Our Fresh Cut Daisies Scentsy Bar is like a meadow awash in summer blooms. With notes of freshly cut grass and clover with daisies, sweet buttercups and green ivy, this is a fresh clean fragrance. Fresh Cut Daisies Scentsy Bar refill is available online. Just in time for summer, this clean fragrance offers notes of cut grass and clover, daisies, sweet buttercups and green ivy. Add 4-5 cubes of Fresh Cut Daisies candle wax cubes to your favorite Scentsy wickless candle warmer and let thoughts of fresh calm transform your space. Scentsy Bars have a very low melting point and are best experienced when used in an electric Scentsy Warmer. With over 80 long lasting fragrances, including our Fresh Cut Daisies Scentsy Bar refill, there’s sure to be a favorite for everyone. Each Scentsy bar is scored to easily break into 8 cubes, and contains 3.2 fl. oz. Our Bora Bora Blossom Scentsy Bar will have you lost in a balmy combination of succulent island fruits and lush orchid, balanced with a kiss of fresh green violet leaf. Bora Bora Blossom Scentsy Bar refill is available online. Time to kick back with your own island paradise with notes of island fruits, lush orchid, and green leaf. Add 4-5 cubes of Bora Bora Blossom candle wax cubes to your favorite Scentsy wickless candle warmer and enjoy a tropical delight of fragrance. Scentsy Bars have a very low melting point and are best experienced when used in an electric Scentsy Warmer. With over 80 long lasting fragrances, including our Bora Bora Blossom Scentsy Bar refill, there’s sure to be a favorite for everyone. Each Scentsy bar is scored to easily break into 8 cubes, and contains 3.2 fl. oz. Our Blueberry Rush Scentsy Bar blends a sweet surge of ripe blueberry with leads of luscious lively cranberry bouquet, black currant and pomegranate. It’s the smell of fruits just picked from the farm. Blueberry Rush Scentsy Bar refill is available online. With notes of ripe blueberry, cranberry, black currant and pomegranate, it’s the perfect sweet springtime fragrance. Add 4-5 cubes of Blueberry Rush candle wax cubes to your favorite Scentsy wickless candle warmer and enjoy the fresh scent of ripe fruits, just picked from the farm. Scentsy Bars have a very low melting point and are best experienced when used in an electric Scentsy Warmer. With over 80 long lasting fragrances, including our Blueberry Rush Scentsy Bar refill, there’s sure to be a favorite for everyone. Each Scentsy bar is scored to easily break into 8 cubes, and contains 3.2 fl. oz. 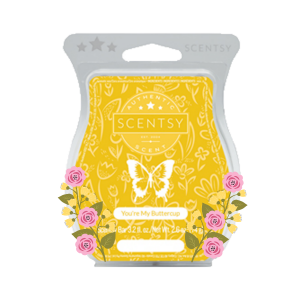 The notes of our You’re My Buttercup Scentsy Bar offer a blend of sweet apple, juicy pear and yellow buttercup while that swirl as softly as a summer day. A wisp of white musk quietly charms in the background. You’re My Buttercup Scentsy Bar refill is available online. With notes of sweet apple, juicy pear, yellow buttercups, and hints of white musk, this fragrance has a soft feminine side. Add 4-5 cubes of You’re My Buttercup candle wax cubes to your favorite Scentsy wickless candle warmer and enjoy the soft side of summer. Scentsy Bars have a very low melting point and are best experienced when used in an electric Scentsy Warmer. With over 80 long lasting fragrances, including our You’re My Buttercup Scentsy Bar refill, there’s sure to be a favorite for everyone. Each Scentsy bar is scored to easily break into 8 cubes, and contains 3.2 fl. oz.